Subscribe for two years and save! Pond Boss is a bi-monthly publication dedicated to helping readers take care of their private ponds and lakes. Each issue of Pond Boss is filled with how-to articles, questions and answers from readers, where to find products and services, and much more. RENEW TODAY! Connect with us! 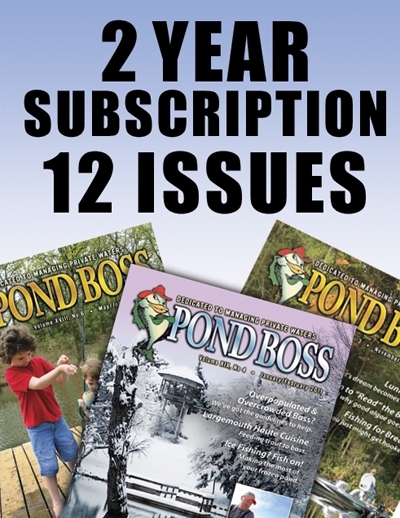 : Pond Boss magazine is now available in digital online format. Choose to receive your subscription in print, digitally online or both formats. Please state your preference in the customer comments section. If you are selecting the digital format, your username and password will be emailed to you, usually within 24-48 hours. This username and password is NOT the same as the one you used to log-in to the Pond Boss Store.